The German steel and metals sector remains resilient with a competitive edge. 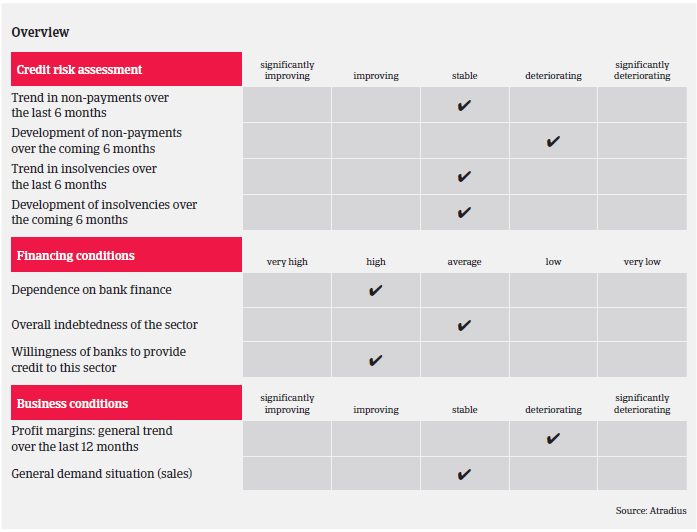 However, major structural challenges and downside risks have increased. 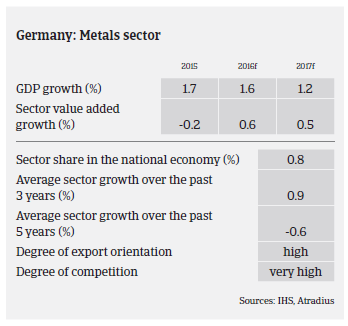 The German steel and metals sector (with its main subsectors metals manufacturing, wholesale of metals and ores, iron and steel) is heavily dependent on the overall development of the German economy, especially on the performance of construction and export-oriented sectors such as mechanical engineering and automotive manufacturing. According to the German Association of Steel and Metal Processing, production increased just 0.5% year-on-year in 2015, and in 2016 production growth of 1%-2% is expected, while the market environment is expected to remain difficult. In 2015, overcapacity and lower prices led to strong competition with decreasing sales and margins and depreciation of inventory. Therefore, the balance sheets of many steel and metals businesses show losses, especially due to the fact that prices deteriorated sharply last year. However, prices rebounded in early 2016, which means that businesses can expect better results in 2016, with improved profit margins. While profit margins are shrinking, the general equity and liquidity of steel businesses in Germany are better than the manufacturing industry average, except for small wholesalers without pre-fabrication and/or steel service activities. Banks are generally willing to provide loans to the steel and metals sector. It is expected that structural challenges (global overcapacities, cheaper imports from China and other foreign competitors, price volatility, geopolitical uncertainties, high energy costs in Germany) will continue to be downside risks for the time being. That said, the German steel and metals sector remains resilient with a competitive edge, due to its high technology products. Market participants remain rather optimistic about the further development of the main steel consuming sectors like automotive, construction and mechanical engineering. But without market adjustment, the economic slowdown in China and the unsatisfactory price development may have further negative impacts on export activities. Additionally, the final outcome of the Volkswagen scandal has to be closely monitored, as automotive suppliers could be affected by lower demand and cancelled orders. We have seen no change in the payment behaviour of companies in the steel and metals sector over the past couple of months, with payments taking, on average, between 30 and 45 days. However an increase in payment delays in some more troubled segments cannot be excluded: the tubes and pipe segment suffered from decreased orders and postponed projects in the oil and gas industry. Those businesses are now more dependent on their credit lines in order to finance their working capital/high inventories and potential losses. Another difficult subsector is scrap recycling where businesses suffer from low steel prices and decreased margins. Additionally, smaller steel traders dealers without additional business like prefabrication and weak equity ratios are facing strong competition and low margins. 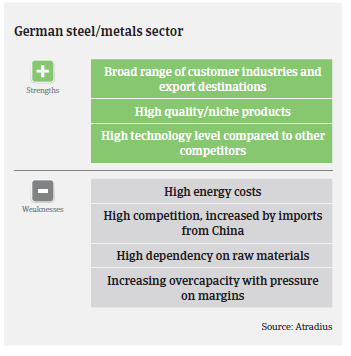 While we are more cautious when underwriting the aforementioned segments, in general our underwriting stance for German steel and metals businesses is basically positive. Insolvencies in this industry are not expected to increase in the coming six months. We pay particular attention to recent financial information (balance sheets, interim figures, bank status, payment terms, duration of contract, order volume, payment behaviour). In 2015, the German economy grew 1.7%, spurred by household consumption which increased 1.9%. Private consumption remains a key driver of growth in 2016.